One of the best things one can say about Quentin Tarantino as a director is that he’s consistent. All of his movies feel the same: rapid cutting/dialogue pattern, shockingly weird and/or anachronistic music, monologues, and insane-borderline cartoonish- violence. So it is with “Django Unchained” a film which shies away from nothing. Even the poster is bloody! This film, like other Tarantino fare, is less about the long meandering plot and more about the characters that inhabit this world that he’s created. 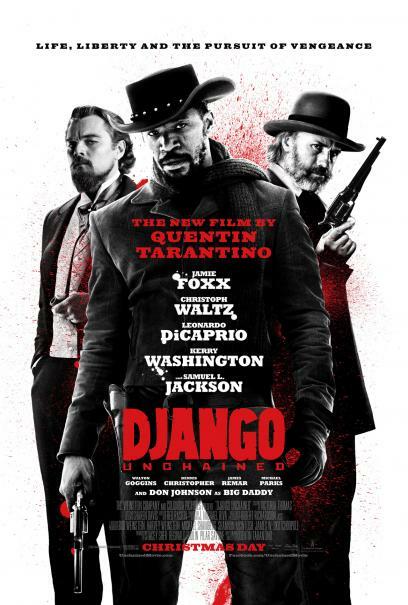 Beginning 4 years before the start of The Civil War, Django (Jamie Foxx) stars as a freed slave who becomes a bounty hunter with his German benefactor (Christoph Waltz). From that jumping off point, we are dragged into a story of love and revenge with a raw and unblinking approach to racism of the time. If you can’t handle the “n” word or other similar slurs you’re better off skipping this film as it’s bandied about as often as anything else. Like all of Tarantino’s dialogue it’s raw and unfiltered but perfectly suited to the reality of each character. Waltz oozes cool menace with every line while Foxx uses his few words carefully, only speaking when he has to. As to ostensible villain-in that he’s the villain inasmuch as anyone is- Leonardo DiCaprio, everything he says is dizzyingly evil and so cartoonishly odd. The script is basically perfect if harsh. But then there’s the directing. Tarantino is not what you’d call subtle. While every shot serves the film, the film could have survived, and I would argue be stronger with a tighter hand in the editing process. Tarantino’s films are always long and winding, but I had a hard time pinning down the plot of this film until the last 30 or so minutes. Yes, it was an engaging story, but if that story doesn’t have a central purpose (or if that central purpose is buried under heaps of other detritus) it becomes pretty tedious. Tarantino is a masterful storyteller but…well watch his film “Reservoir Dogs.” That film opens with a long story about the “true” meaning behind Madonna’s “Like a Virgin” that is odd but in a thoughtful way. It’s a well performed piece and it has an interesting point but it takes at least 7 minutes to get there. It’s his style and to Tarantino’s immense credit his style never overwhelms his substance, but it does make his substance take the long way around as it were.